Tofu – give it a try! If you are trying to minimize the use of meat in your cooking you might want to consider tofu. Most people just roll their eyes when they hear the word tofu, but I’ve recently learned a few things about working and cooking with this Japanese food. First let me explain quickly that tofu is made from unfermented soy bean curd. It’s creamy colored, has the texture of baked custard and can range from being soft to firmer. The appeal of tofu is that it is completely tasteless which makes it a food that pairs well with about anything you choose to cook it with. Also, because of its bland taste, it becomes the perfect host for all kinds of marinades. Tofu is typically packaged in small square containers with water. When you open your carton of tofu you should first drain off all the liquid you can. Then set the square of tofu in the center of a pie plate. On top of the pie plate set a regular dinner plate and then weigh the plate down with a heavy object. You should try and find something that weighs about three pounds. Use objects that aren’t too tall because as the plate presses down on the tofu it may tip to one side or another causing whatever’s on top to fall off. So choose a heavy object that isn’t too tall and set it on top of the plate. The weight needs to rest on the tofu for one to two hours. What works best is to set everything in the fridge in the morning and by dinner time it will be ready. 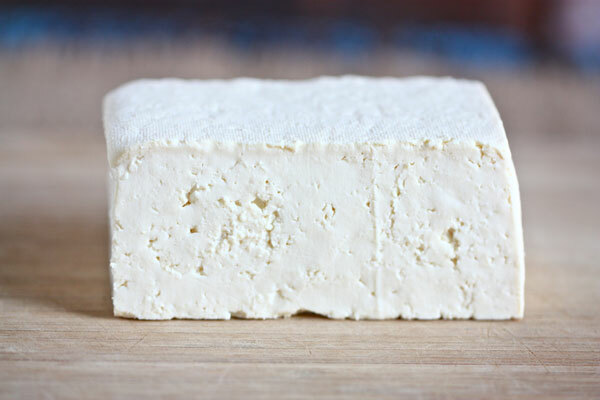 Drain off the liquid from the pressing and then cut the tofu in either ½ inch slices or cubes. And at this point, because you’ve pressed out most of the internal liquid the tofu will more readily accept a marinade, should you choose to marinate it. The marinade can be something Asian like a ginger and soy marinade or any of the bottled marinades will work well. After an hour of marinating, it’s ready to be cooked. Tofu can be steamed, grilled, pan-fried, added to casseroles or included as part of a stir fry. It is truly versatile and much better tasting when pressed and prepared this way.